Think back to when you were at school...that familiar smell of Deep Heat in the changing rooms before a sports match, and Deep Freeze afterwards (or the screams from the ice baths); using heat and ice on sore or damaged muscles is nothing new in sports science. However, it's not something I've ever been that taken with; it works, but I've never liked the idea of spraying my legs with chemicals. 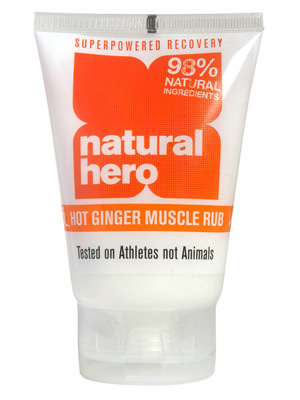 Finding out about Natural Hero Muscle Rubs was therefore a welcome discovery! With almost 100% natural ingredients, the efficacy of these rubs come from natural sources, as does the scent, feel and ethos of the product. 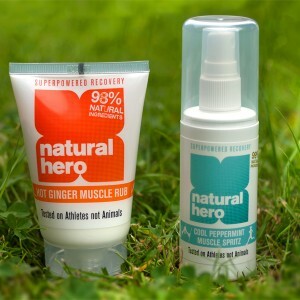 Natural Hero produce two great products: the Hot Ginger Muscle Rub and the Cool Peppermint Muscle Spritz. I've given both a good bit of testing over the last week or so, and both seem to work very effectively, smell natural and feel great. It's a fantastic approach to sports medicine, and certainly the route that I'll be heading down for muscle recovery products from now on. Heat is generally used for injuries that have no inflammation or swelling. Heat therapy is ideal for sore, stiff, nagging muscle or joint pain. Athletes often also use heat before exercise to increase the elasticity of joint connective tissues and to stimulate blood flow. Heat can also help relax tight muscles and reduce muscle spasms. Cold therapy with ice is the best immediate treatment for acute injuries (sprain, swelling, hot feeling injuries) because it reduces swelling and pain. Ice is a vaso-constrictor (it causes the blood vessels to narrow) and it limits internal bleeding at the injury site. Cold therapy is also helpful in treating some overuse injuries. For example, an athlete who has chronic knee pain that increases after cycling, may want to ice the injured area after each ride to reduce or prevent inflammation. The Hot Ginger Rub contains Ginger Root, Rosemary, and Sweet Fennel oils, which give a notable warming and soothing effect to help ease fatigued muscles. The lotion is non-greasy, smells pleasant (certainly a lot better than deep heat!) and feels nice on the skin. The warming effect lasts for about 40 minutes in my experience, and helps to stop your muscles stiffening up if you are sitting around for a long period after a workout earlier in the day. I've used it after a few hard turbo sessions, when my muscles have been sore from blasting them in the intervals, and the effects have certainly been noticeable. The Cool Peppermint Spritz is a neat spray containing Peppermint oil, Blue Chamomile, White Willow, Arnica and Witch Hazel, which deliver dual effect cooling then soothing actions to revive and ease tension. You can use the spray post exercise to ease fatigued muscles or sore joints, but also pre-exercise to help in warming up particular trouble spots. 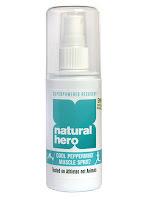 On colder days in the last week or so I've used the spray on my knees (before putting my leg warmers on), to help warm the joints up and serve to prevent injury. It seems like an effective, pleasant way to get your trouble-spots sorted both before and after exercise. The cooling and warming effects of Natural Hero products are down to their blend of active botanicals known as rubefacients. Both hot and cold sensates can feel pleasant on the skin and are beneficial to sports recovery. This is due to their action as rubefacients or counter-irritants. Rubefacients are powerful stimulants; some have a ‘warming’ effect, and others a ‘cooling’ effect. Rubefacient herbs are a class of botanicals which have a unique effect when applied to the skin. The mechanism for their warming and cooling action goes beyond simply ‘taking the mind off the pain”. It is now thought that counter-irritation acts to suppress any discomfort at spinal cord level in accordance with ‘gate-control theory’; the same mechanism by which TENS is thought to act. Rubefacients stimulate the dilation of capillaries. Blood is drawn from deep within the body, increasing circulation around the treated area, helping speed the recovery process. Two great products then, with a very welcome natural approach. My room and kit bag no longer smell of Deep Heat chemicals, but of ginger and peppermint (fortunately not quite at the full Lush soap shop level yet though). If you have trouble with your joints getting sore during or after exercise, these products will be a real help; they can also benefit everyone who gets the DOMs after a hard workout, and wants a hand in the all important recovery process.